« *** WINNERS *** Brooke and Jodi are Living the Life of Riley! CONGRATULATIONS! If there's one lesson in life I've learned the hard way, it is that you should ALWAYS have your digital data (photos, documents, videos, etc.) stored in AT LEAST two places at one time. I've had pretty good luck with computers so far and have never had a dud...until about a year and a half ago. We had just purchased a new desktop computer and I had ALL of my valuable memories, music, etc. stored on it and it alone. Suddenly, with no warning and no reason, the hard drive in my brand new desktop failed! Riley was only 5 months old at the time and I was devastated! Everything was gone! We even sent our hard drive away to the "experts" who were going to try and recover all of our information off of it, but they said that the failure was so bad, that it would cost at least $900 to fix and even then, they couldn't guarantee what they could retrieve! Luckily, by the time I pieced together things I had burned to CDs and still had stored on digital cameras and camcorders, it seems that I only lost about 2 weeks worth of pictures and videos. I cried and cried and was crushed for months after that, but at least I hadn't lost EVERYTHING! So now, I take backing up all of my data very seriously and was thrilled to have the chance to review the Hitachi LifeStudio Mobile Plus 500 Gb Hard Drive! 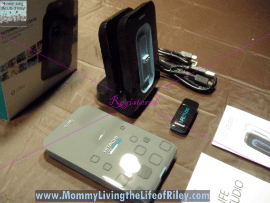 I reviewed the LifeStudio Mobile Plus 500Gb Hard Drive from Hitachi, which retails for $139.99. The first thing I noticed about the Hitachi LifeStudio Mobile Plus 500Gb Hard Drive was how small and sleek it looked! This hard drive is also unique because it contains a Smart 4Gb USB key (which looks like a jump drive) that auto-syncs back to the main unit. This 4Gb component is perfect for keeping in your purse or laptop bag so that you always have a way to store information when you leave the house. 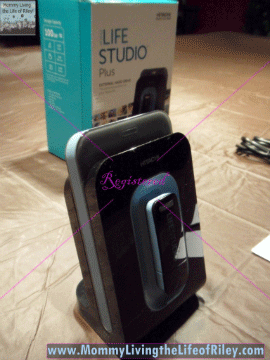 The LifeStudio Mobile Plus comes with the cradle, which houses both the main hard drive as well as the 4Gb USB key, a standard USB cable to connect the drive to your computer, and a super USB cable, which actually has two USB ends on it. These two USB connections are BOTH plugged into your computer so as to give the LifeStudio more "juice" for even greater power! I'd never seen anything like that and thought that this two-headed cable was a very clever idea! Of course there is a reason that Hitachi chose to name this hard drive the LifeStudio. This is one very unique hard drive because it is meant to be so much more than a mere storage area. It is designed to actually organize, store and display all the digital aspects of your life! This hard drive comes complete with the Hitachi LifeStudio software which installs and downloads itself to your computer in a matter of minutes. All you need to do is connect the USB cable from your LifeStudio Mobile Plus to your computer and Hitachi takes care of the rest. Hitachi's LifeStudio software installed two icons to my desktop. One entitled, "Hitachi Backup" and one entitled "Hitachi LifeStudio". Since I hadn't performed an actual backup of my files yet, I decided to click on the backup icon. I was pleasantly surprised at just how easy Hitachi made it to backup my media. It already had the right folder clicked to backup and all I had to do was turn the feature on. Immediately it began backing up my media. I can even schedule regular backups, which Hitachi will take care of for me, so that I never have to remember whether or not my memories are stored and protected. LifeStudio even offers an online storage option too...for FREE! You can get 3 Gb worth of online storage, or cloud storage, from Hitachi so as to save your most valuable data. Now that my backup was taken care of, it was time to see what the Hitachi LifeStudio software could do! For a much more elegant and thorough demonstration of the Hitachi LifeStudio Mobile Plus, watch this quick video...it captures just how awesome this product is! In no time, the Hitachi LifeStudio software had cataloged all of my music, videos, and pictures into a huge 3D wall of memories! At the mere touch of a button, I could scroll through all of my media and watch or view it instantly. Everything was organized too! My pictures were sorted chronologically by both month and year. It was so neat seeing them displayed on the 3D wall, because there were so many that I had forgotten all about! I had so much fun just going back through old pictures and memories! My music was sorted by both artist and album, so finding a great song to jam to was super easy! The Hitachi LifeStudio even has a full screen slideshow option which turns your computer into a full multimedia display. I can't believe that Hitachi has created a hard drive which is a complete digital media storage, organizational and presentation solution. If you're looking for a permanent way to backup your digital data, then I highly recommend the Hitachi LifeStudio Mobile Plus Hard Drive! 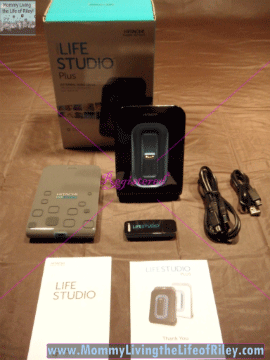 Disclosure: I received the LifeStudio Mobile Plus 500Gb Hard Drive from Hitachi in order to facilitate my review. No other compensation was received. This product review is based on my own personal experiences with this item and is completely honest and objective.